I motored out into light headwinds and anchored overnight in a quiet bay about 20 Nm north west of Midland. I came across this setup in the marina yesterday morning. 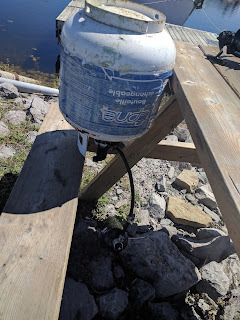 What you are looking at in this photo is a way of recharging those small propane cylinders that campers use for portable stoves and lighting. I had read about the method but never actually seen it before and so I was quite interested in seeing it done. What you do is attached a hose between the two cylinders and put the large one upside down above the empty one. 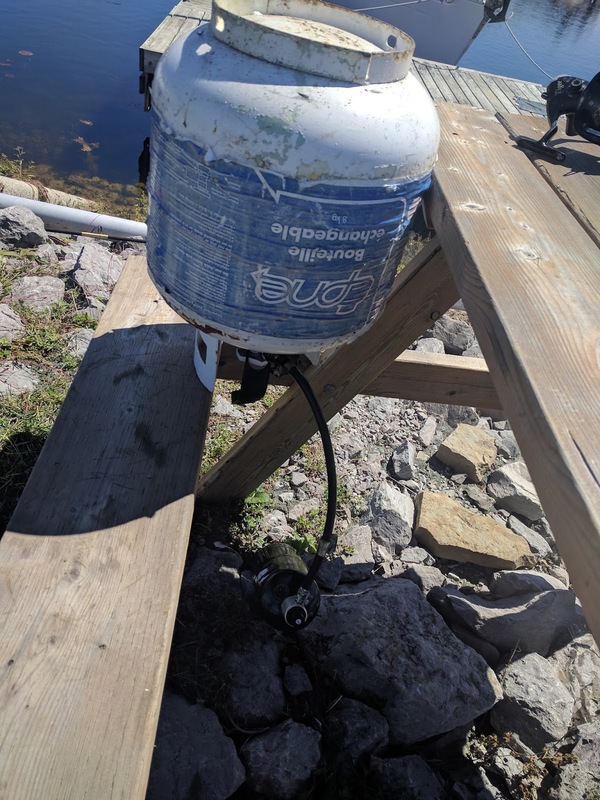 I don't use these small cylinders but even if I did, I probably wouldn't do this because they are only $2 each in Walmart and I don't own a fire suit. Safety aside, I must admit i don't agree with the throw away society we live in and it goes against my grain to throw away these cartridges. Meanwhile it is COLD this morning. I tried to find a Mr Buddy heater in Midland without luck. I am looking forward to sailing (instead of motoring) north to Parry Sound today where I hope to hunker down for a couple of days while waiting for some weather to pass through.